so - now I decided to post it here at CA. 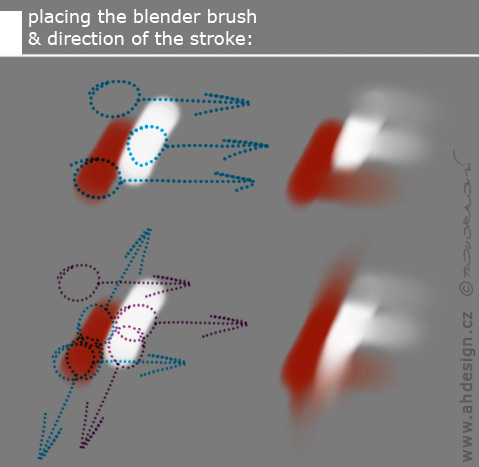 The tutorial is not intended to be considered as "the only way" of how the blending technique works, since - I am sure - different artists use their own different approaches; so - this is just the way I work (incl. a few very basic general rules), in case someone is interested. The "trick" here is the "Resat" slider (= Resaturation value; available either at the upper Property Bar - or - within the Well pallete). This "Resat" value modification is especially usefull when you want to keep the same characteristics of the painting brush also while blending (size, opacity, bristels/tip type, grainy structure if any applied etc .. ). Often it is a good idea to increase also the Bleed value/slider, so as the colors/pixels can mix/blend together more naturally ..
(1) for best results - you should always blend only in a separate layer above the canvas (or above the layer with the painting, if any); the blenders can be used also in the canvas, but - to get best results - blending works best when in separate empty layer, above the painting/pixels you want to blend (this is a good way how to work also for another reason - while blending in a separate layer, you wont ruin your underneath painting in case your blending process wont turn out well); personally - I got used to keeping every single "important" element of an illustration in its separate layer - until I am satisfied - then I drop everything down, and - again - create another new empty layer/layers above, to proceed with something else .. and so on ..
You can of course change other attributes too, the Opacity and the Size are usually the most often used/useful ones while painting/blending, etc. So - this means - you can get many (many!) 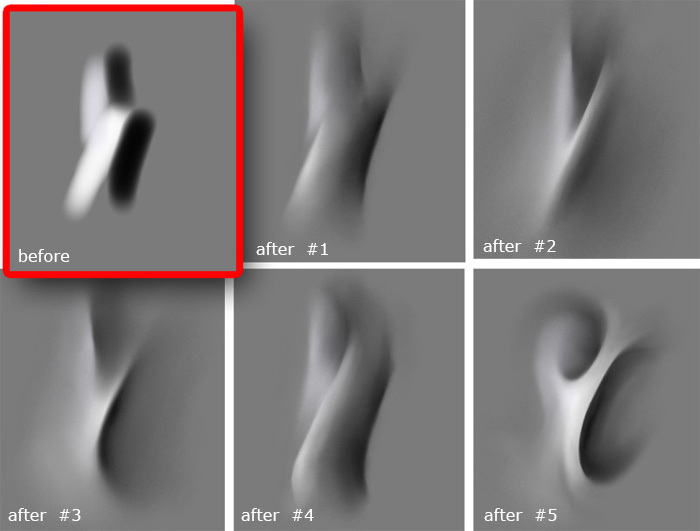 absolutelly different results from the same initial painting, whatever it may be (you can start with something really simple, a few painted brush strokes, for example, see below), since the blending process may be performed in many different ways, which leads to different behavior of the Blender. and - in all 5 examples - I started up with the the same initial simple black/white strokes (seen in the red-border). The only difference here was the WAY HOW I dragged the brush (direction, repetition, "sampling" starting positions etc. - you can use not only black/white limited pallette ..
- you can use whatever blender/brush type you might need ..
- you can even combine blending and painting on the fly - after defining some basic blended shapes, just add/paint some more strokes of "color/pixel information" to work with again, and blend again ..
As you should see in the demo - another important thing to keep in mind is WHAT areas to blend, and WHAT just not. 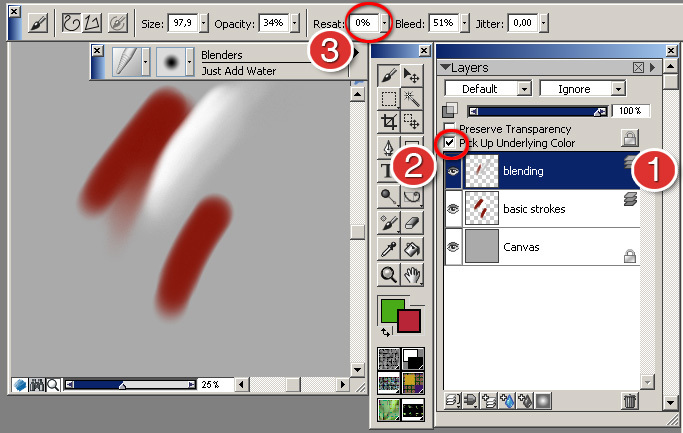 You can either shapelessly blend everything together - just to get a smooth transitions between colors/values, without any other particular "painting" purpose - or - you might want to keep some shapes "untouched" while blending. And the way you spread the existing pixels/colors has a great impact on what the final "blended shape" looks like .. This kind of "one-sided" blending is actually the very basic/fundamental and the most powerful blending technique, that lets you achieve (combined with a little pre-planned initial painting) whatever shape you might think of, literarly ..
adding some more examples illustrating the technique ..
blending just as a part of an illustration process ..
Really want to play around with blenders and painter now! It is quite the same in Painter IX, for all of you out there IX users. The only difference is that when the blending is on a separate layer there are some weird looking pixels around the edges of the blending. They can be erased however, but I still perfer do duplicate the layer I'm blending, so I have backup copy and then just go mad on it. Great tutorial, very well explained. Thanks. This is getting seriously serious. This tutorial was sponsored by wonderbra. very2 useful tuts.. thank you very much.. This is really useful. Thanks very much for taking the time out to do this! Great tutorial! Thank you so much for taking the time to do and post this tutorial. may i have the program link? This is a great tutorial, I just tried out the blending and I love water rake.